When starting out as a beginner, this question comes in everyone’s mind. Which one is better? Is it better to pick the Self Hosted WordPress.org, or is it better to go with Free WordPress.com? 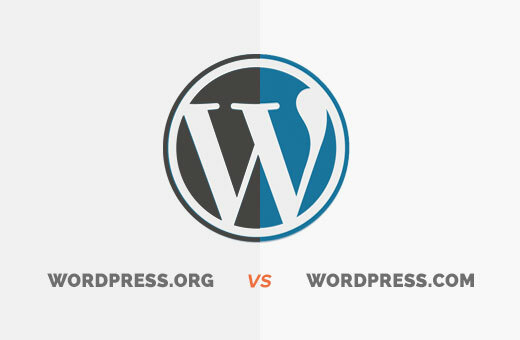 In this article, we provide you with an infographic that compares WordPress.com vs WordPress.org side by side with list of pros and cons. We also tell you in the end which one is our pick. Click on the image to see the full version of the Infographic. Note: We have updated this infographic because there was a huge debate about the comparison. 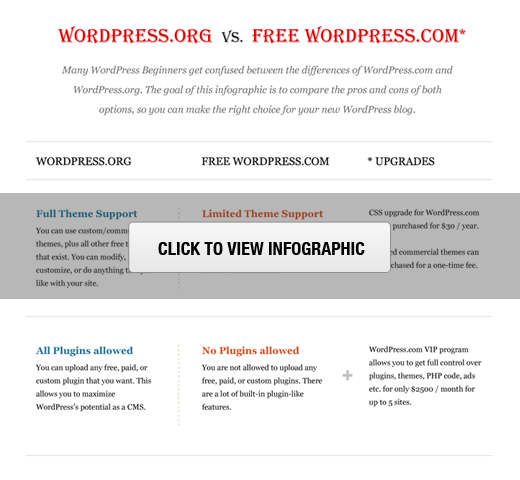 The goal of this infographic is to compare Self Hosted WordPress.org vs. FREE WordPress.com*. We were called out by many folks saying, WordPress.com offers CSS upgrades etc. etc. But apparently, we were not clear enough in the title when we said we were comparing to only FREE WordPress.com. This new infographic indicates with a * all the upgrades that are possible. Another reason for the update was that the numbers used in the infographic were outdated. It’s free and super easy to use. You own your data. You are in full control. Your site will NOT be turned off because someone decides that it is against their terms of service (as long as you are not doing something illegal). You are in control. You can upload and use plugins. You can upload custom themes. Modify theme files (not just styles) if needed. You can make money from it by using your own ads, and doing things your way. You are responsible for updates. WordPress upgrades require 1 click (Not too hard eh). You are responsible for backups, but thankfully tons of amazing plugins are out there like BackupBuddy. You are responsible to prevent SPAM, but if you enable Akismet (which comes built-in with WordPress.org), then you won’t have to worry about it. It’s free for upto 3GB of space. After that you will have to pay for space ($19.95 per year for 5GB) or ($289.97 per year for 100GB). They make regular backups of your site. If you are a personal blogger who do not care about making money from their sites, then go with WordPress.com. If you are a blogger trying to make blogging into a career, then you want to use self hosted WordPress.org. Often people will say, self-hosted WordPress will cost you money. For a small enough site, it is actually cheaper. Let’s say you use WordPress.com, buy their custom domain ($17 per year), pay for ad-free option ($29.97 per year), and get custom design upgrade ($30 per year). That total is $76.97, and you are still not in full control. For WordPress.org, you can use Bluehost (officially recommended by WordPress) which costs $3.95 per month so $47.4 per year, and it includes a free domain name. If you go with other web hosting companies, then you will pay a similar price, but you won’t get a domain. However, you can get a domain name for $10 from Godaddy or NameCheap. Your total would come to $57.4 per year. You will have full control over everything. Here’s a step by step guide on how to start a WordPress blog. We hoped you like the infograph. If you liked it, make sure you share it on Twitter, Facebook, or any other site that you like (of course with a credits link back to WPBeginner – preferably this article).